Solo "the day after" anche in Italia sui "canali ufficiali" iniziano a fare la loro timida apparizione le interpretazioni serie e corrette...in collocazioni comunque assai meno visibili dei titoloni/commenti bufala di ieri. Ha senso smontare quotidianamente le solite cazzate mistificatorie che si leggono nei titoloni dei principali canali informativi? Ha senso farlo? 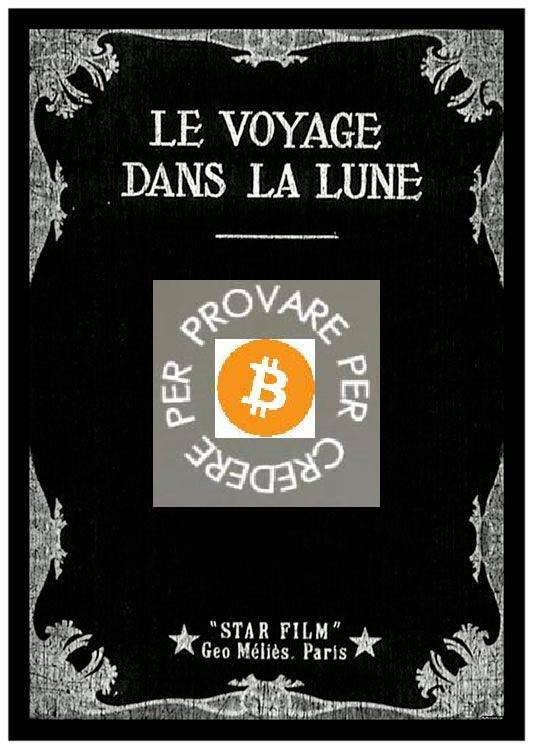 Certe volte penso di NO. Tanto la massa si fa fregare allegramente lo stesso ed io riesco ad informare correttamente solo una "mini-minoranza". Tanto se le borse-casinò hanno voglia di salire, salgono anche sulle stronzate mistificatorie come questo dato immobiliare o come gli stress-test-di-tutto-relax...o meglio usano questi "falsi segnali scenografici" come volani per fare i loro giochetti, in SU od in GIU'. Anche se, visto che ormai L'IGNORANZA e la COCA dominano sovrane, mi sorge il dubbio che una buona parte dei coca-cow-boys-gestori prema sul tasto BUY perchè legge solo i titoloni e perchè a queste tavanate ci crede veramente...è possibile. O sono scemi, o sono ignoranti o sono COCA-cow-boys-gestori....oppure sono dei GRAN FURBONI (più probabile quest'ultima ipotesi...). Se anche il dato risalisse a 400mila o 500mila, farebbe sempre CAGARE. Punto a capo. QUESTO INVECE E' UN TITOLO SERIO made in USA: cari mass-media italiani, imparate come si lavora seriamente nel campo...se avete le mani libere per farlo! Ignore all the month to previous month comparisons. May was revised down sharply and that makes the increase look significant. Here is the bottom line: this was the worst June for new home sales on record. The Census Bureau reports New Home Sales in June were at a seasonally adjusted annual rate (SAAR) of 330 thousand. This is an increase from the record low of 267 thousand in May (revised from 300 thousand). Click on graph for larger image in new window. Note the Red columns for 2010. In June 2010, 30 thousand new homes were sold (NSA). This is a new record low for June. the record high was 115 thousand in June 2005. Sales of new single-family houses in June 2010 were at a seasonally adjusted annual rate of 330,000 ... This is 23.6 percent (±15.3%) above the revised May rate of 267,000, but is 16.7 percent (±10.9%) below the June 2009 estimate of 396,000. 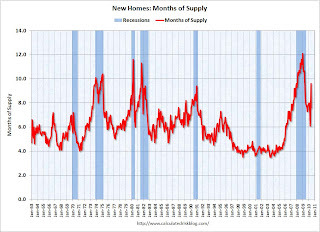 And another long term graph - this one for New Home Months of Supply. Months of supply decreased to 7.6 in June from a revised 9.6 in May (revised from 8.5). 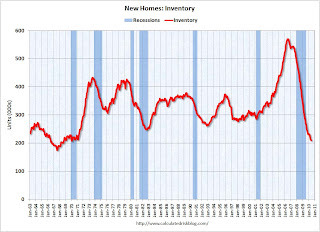 The all time record was 12.4 months of supply in January 2009. This is still very high (less than 6 months supply is normal). The seasonally adjusted estimate of new houses for sale at the end of June was 210,000. This represents a supply of 7.6 months at the current sales rate. The 267 thousand annual sales rate for May is the all time record. This is a very sharp downward revision. The 330 thousand in June is the worst June on record. With all the gyrations, it is difficult to see what is happening month to month, but overall this was a very weak report. The media’s first reaction to the Commerce Department’s new home sales number was, in almost ever case, positive. 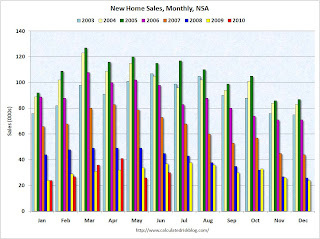 June showed an increase in new-home sales to a seasonally adjusted annual rate of 330,000 . Most analysts expected that number to be closer to 315,000. May numbers were worse than had initially been announced–by a great deal. 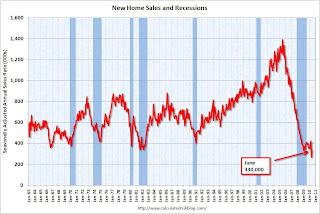 New-home sales fell a revised 36.7% two months ago to a record low 267,000 level. The previous estimate was a 32.7% fall to 300,000. There is every reason to believe that the June numbers could be revised lower as well. The May drop should be attributed to the expiration of federal tax credits for buyers of new and existing homes. The months that follow May are not likely to get better and as the year wears on, could get worse. The headwinds for an improvement in housing continue to be high default and foreclosure rates, unemployment, and concern that home prices could fall much further. Inventory in particularly hard hit regions is not contracting, and contraction in other areas of the country is barely visible if it is visible at all. The most worrying litmus test for housing is that mortgage rates are at all-time lows. Even this has not enticed buyers back into the market. Housing will not improve soon. It could drop another 15% to 20% in some cases, and it will take that to turn the dynamics of transactions back toward the sellers, even if those sellers are more desperate than they are today.